Should Your Company be Run as a Democracy? A business owner recently explained that her company was planning to reduce the staffing budget. She wanted to allot more funds to launch a new product in the marketplace. Her idea was to put five hourly, non-exempt, administrative staff in a room and have them figure out, on their own, how to handle the reduction. The options included an overall reduction of hours for each, to one or more employees losing jobs. The group was expected to work it out among themselves and the business owner would agree to whatever was decided. My response to the client: Your business is not a democracy so don’t entrust key legal decisions to staff. Employees don’t necessarily have their employer’s best interests in mind and may not understand the legal ramifications and liabilities of their democratic decision. Democracies are for governments. 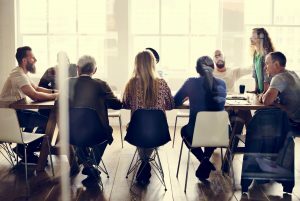 Business owners must retain power and authority to make organizational decisions, despite the sometimes painful consequences of those decisions on staff. That’s not to say that employees can’t or shouldn’t have input into certain matters (e.g., where to hold the office holiday party this year), but ultimately, key business decisions like layoffs should not be delegated. Owning a business is wrought with challenges, but leaders don’t shy away from making tough decisions. Staffing decisions should always be well-reasoned and legally justified. For example, when downsizing a department, you should consider existing contracts, written policies, past practices, seniority, protected classes, benefits, insurance, performance history, and skill set. If your business is considering making changes, let’s talk it through!